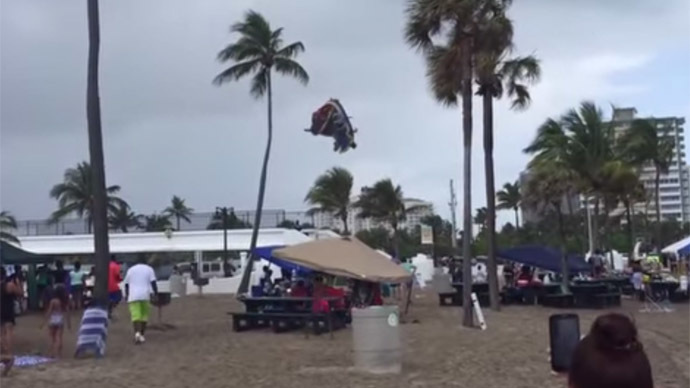 A Memorial Day attraction at Fort Lauderdale Beach Park in Florida went terribly wrong when a sudden waterspout uprooted and overturned an inflatable bounce house, injuring children inside, before lifting it some 50 feet (15 meters) up in the air. The video of the accident posted on YouTube shows the inflatable house flying above palm trees, across a parking lot and over four lanes of traffic. “There was no indication a waterspout was forming,” said Fort Lauderdale Police Sargent DeAnna Greenlaw. “It was fast and furious.” The Children were ejected before the inflatable structure flew above palm trees police said. “They were immediately dropped out of the bounce house onto the sand,” Fort Lauderdale Police spokesman Keven Dupree said. Still three of the children who were inside the bounce house during the early afternoon incident were injured and had to be taken to Broward Health Medical Center. All of the kids were under the age of eight, according to Greenlaw. One of them will be held overnight. The other two suffered fractures and minor injuries, but have already been released after receiving medical treatment. A waterspout is an intense columnar vortex that occurs over a body of water and looks like a tornado. But unlike tornadoes, waterspouts don’t need thunderstorms to form. At the time of the accident, a band of clouds had developed over the ocean creating winds favorable for waterspout formation. “It developed very close to the coastline and moved onshore, and it dissipated very quickly onshore, like any other waterspout,” said Jeral Estupinan, a meteorologist with the National Weather Service in Miami. The bounce house had been secured to a basketball court as part of a city-sponsored family activity zone set up for the Memorial Day holiday. The waterspout snapped a concrete pole holding a basketball hoop. No vehicles or pedestrians were hit by the airborne bounce house and no other injuries were reported.